Here is a quick post to get you in the Halloween spirit! Because Halloween falls on a Wednesday this year, many parties are happening this weekend & in case you are going to any tonight or want to still be a little festive this Wednesday, keep reading! For my nails, I decided to do a skittle mani of different spooky Halloween icons! Many of the designs I used are from MissJenFabulous' YouTube channel. 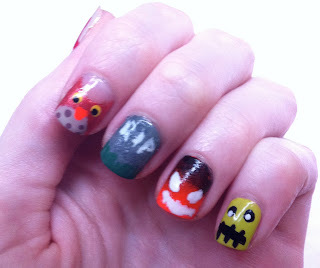 Check out her blog to see great tutorials on some spooky nail art. The only nail art that wasn't on her channel is the grave stone on my middle finger. I thought that would be a good image to use for nail art since a headstone is the shape of your nail. For that I painted my nail black, then used a make-up sponge to apply gray nail polish over it for a textured stone look. Then, I used a small nail art brush to add the grass at the base & the RIP letters. I love how each nail is spooky but cute at the same time. I think my favourite has to be the Owl on my index finger! Lucky for me owl designs are a year-round thing! My least favourite is my thumb. I wanted to do blood spatter using a straw-splatter technique, but it just wasn't working for me. For a quicker, uniformed, and a little more classic Halloween look, I did a gradient of orange & black. I really love how this looks, but you know how I love gradients. I used Color Club Lava Lamp, Wet n Wild Black Creme, and a make-up sponge to get this look. I just love how it is instantly recognizable as Halloween. It's also nice to bust out a bright neon! I did these nails in time for the Halloween party I went to on Thursday. Preston and I went to HallowMEME, an annual costume party where everyone dresses up as their favourite internet memes. There was a costume contest, a Gangnam style dance off, & overall just a lot of nerdy fun! I'm Spaghetti Cat. Google it!